← My weekend + Our living room before & after pics!! 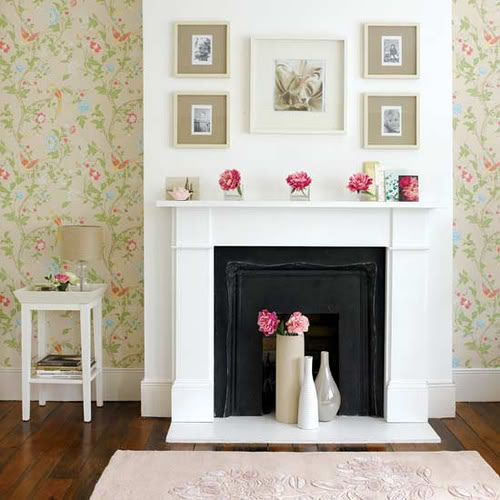 I find that the fireplace mantel is one of the most annoying things to decorate! What do you put up there without making it seem cluttered?? First you have to decide what style you like. Do you like symmetry and balance with matching accessories? Or do you have more of an eclectic eye (like me).. 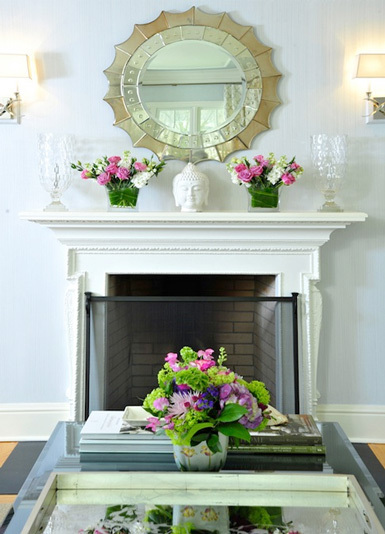 The mantel below has two tall vases on either side + two matching floral arrangements, creating that cohesive look & bringing symmetry to the space. 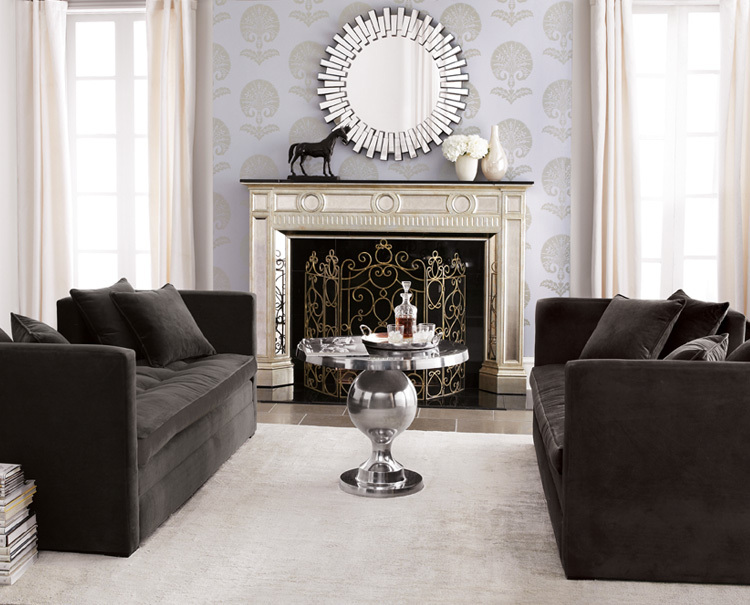 The sunburst mirror above the mantel emphasizes the focal point that is the fireplace. You could also use a color throughout the design of the space. Like black & gold shown below. 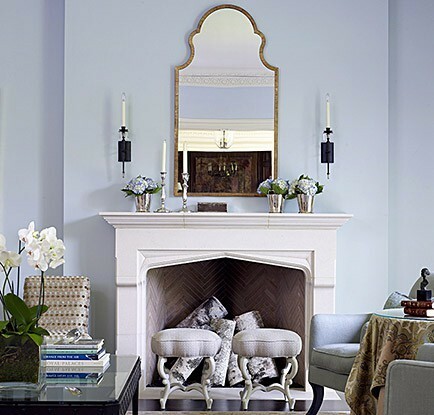 Even though the accessories don’t match perfectly, the mantel still looks pulled together because you are sticking to one or two colors. 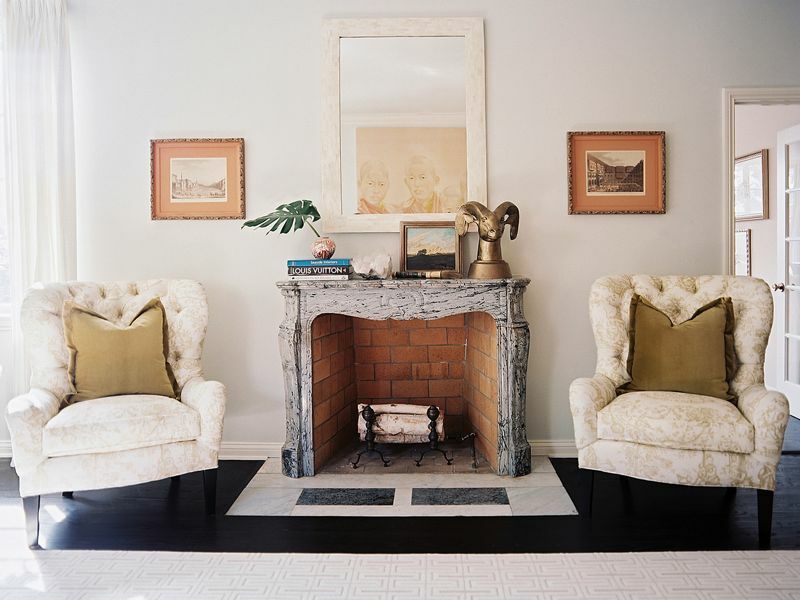 Again this mantel looks pulled together because of the color theme – browns, gold and cream. Using colors to create a cohesive look is my favorite, since I don’t like accessories to be matching and perfect looking. 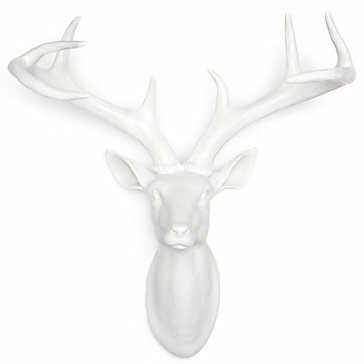 You can still add interest with framed art & antlers/faux deer head – here’s a deer head I found at Zgallerie – Pretty cute! 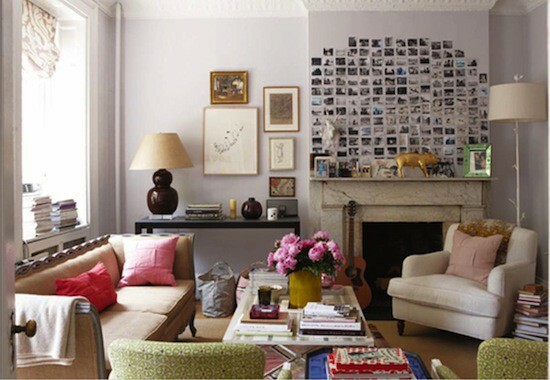 This photo collage above the fireplace mantel is so awesome!! Seriously cutest idea. I have my own little DIY project coming up that involves a photo collage. I’ll keep you posted! 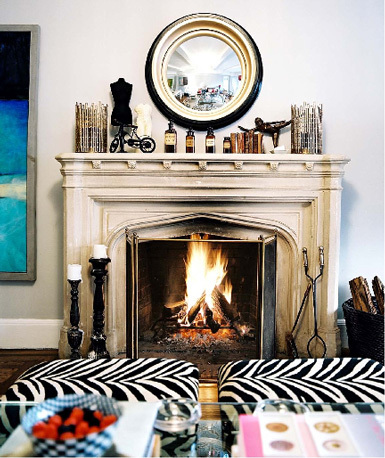 What fireplace mantel decor ideas do you like? My fireplace mantel is in need of some TLC, so I’m open to any ideas/suggestions you have! Okay, I promise I’m not stalking you! But here’s a question: what does one do when one has done something ill-advised and mounted the flat-screen over the mantel?! 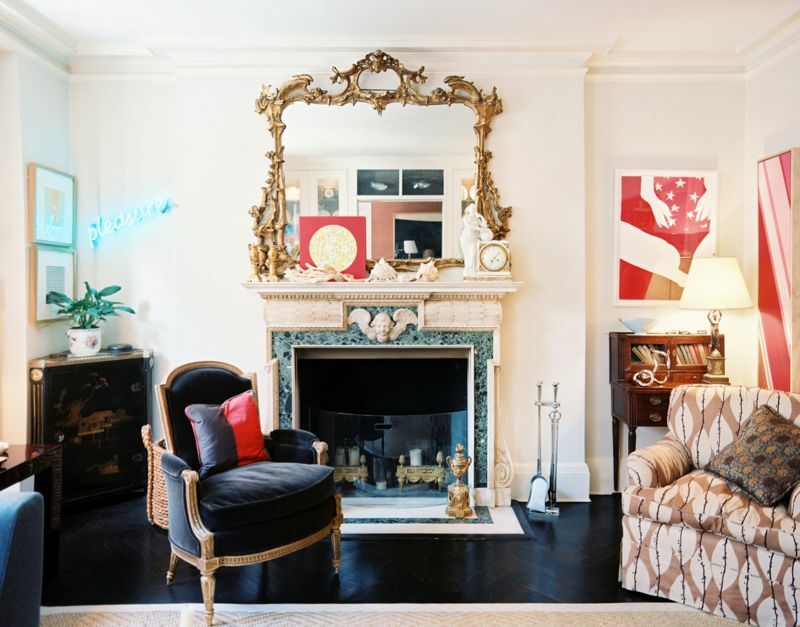 I have a loooong mantel, half of which stretches over a painted-white fireplace hearth that looks almost identical to yours, the other/left half of which stretches (in the same long piece) into 3 built-in bookcases. (Does that make sense?) I might have a photo of it on my blog somewhere. Anyway – I need to accessorize on the mantel without making it too busy. Thoughts? Thanks!